The 12-bout lineup for the Octagon’s debut in Nottingham has been finalized. 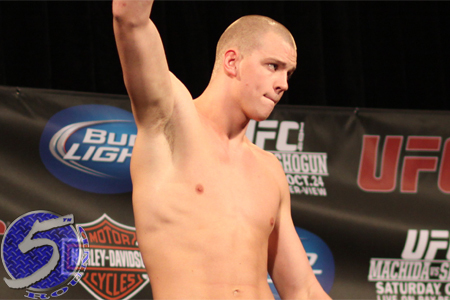 “UFC on FUEL TV 5″ takes place September 29th and showcases a heavyweight shootout between Stefan Struve (Pictured) and Stipe Miocic. The “Skyscraper” will be riding a three-fight winning streak into the 265-pound affair. Struve has rattled off victories in five of his last six scraps, with the 24-year-old’s most recent W coming in May’s submission over Lavar Johnson. Miocic is perfect through his first nine professional fights. The striker post a TKO win against Shane del Rosario in his last outing at UFC 146. Although an official announcement hasn’t been made, the UFC’s Facebook page is expected to offer a live stream of all the prelims. FUEL TV will then broadcast the six featured scraps live beginning at 4PM ET/1PM PT. Capital FM Arena in England plays host.